What kind of training do the teachers have? Our teachers have teaching degrees in either early childhood education or elementary education. 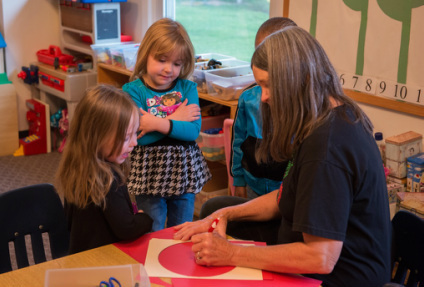 What type of curriculum is used at Community Preschool? We provide a curriculum that is developmentally appropriate. 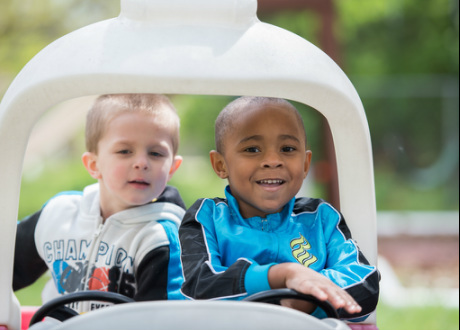 We encourage an unhurried atmosphere with hands-on activities to enhance learning in all areas of development: social, emotional, physical, language, and intellectual. How long has Community Preschool been in existence? Community Preschool began in May of 1946 to provide a preschool experience for the children of those who were training as psychiatric doctors at the Veterans Hospital. It was housed in a variety of places before the building was built at the present location in 1953. Community Preschool has been a parent cooperative from its inception. Does Community Preschool’s schedule coincide with any school district? Our school calendar will coincide with some of the area school districts on occasion, but sometimes our schedule will differ from theirs. Why is tuition the same each month? Tuition is based on the cost for the entire school year and then divided into 9 equal payments for your convenience. Some months we are here more days than others, but it would be confusing to pay a different amount each month. When my child has a birthday, will they move up to an older class? No. Just like in elementary schools, we place children in classes for the entire school year. What do you considered potty trained? Children need to recognize the need to use the toilet and be able to get there in time. They need to be wearing underwear, not pull-ups. They should be relatively self-sufficient in the bathroom. They do not have to be night-time trained for our purposes. Newly trained children should be accident free for a minimum of two weeks before we consider them fully potty trained.